I’m now writing this from my temporary apartment in Bangkok, where I’ve been making great progress on my new site – Price of Travel – and that made it hard to motivate myself to keep up on my travel tales. Nevertheless, I do want to at least write some thoughts and share some photos of each stop, so here we go. After Saigon I was on my way to Phnom Penh, Cambodia, and the popular thing to do in between is visit the Mekong Delta region of Vietnam. For some reason this never brought up wonderful images in my mind so I was always kind of on the fence over even checking it out. But I did leave myself time for six days before my visa extension expired, so I could either stay in Saigon or head straight to Cambodia if I wanted. Saigon was relatively expensive and very crowded, and I did want to see what the Mekong Delta was all about, so on I went. 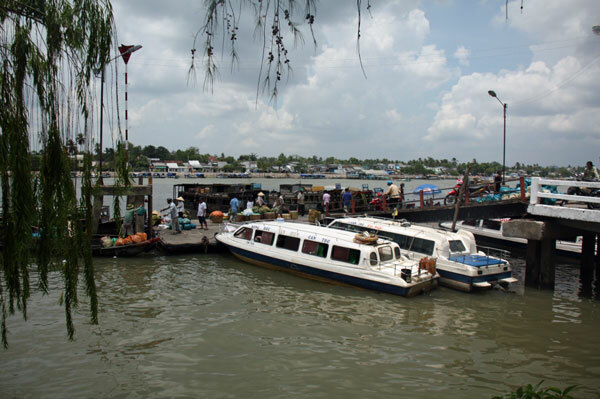 There are actually around 8 or 10 towns in the Mekong Delta that have some kind of tourist infrastructure, and in the end I chose two of them to spend 3 days each in. 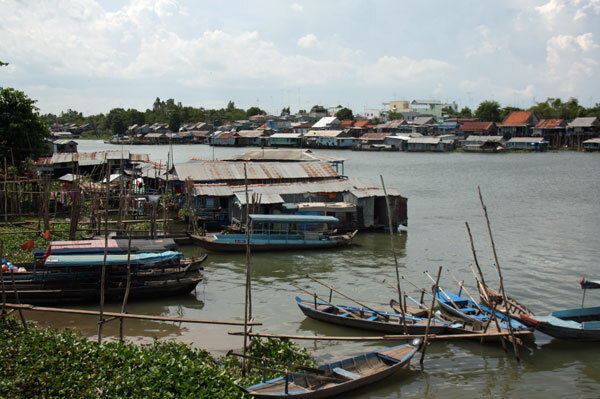 First I would go to Can Tho, which is the largest city in the region, and then I would go to Chau Doc, which is near the Cambodian border and hosts various boat trips directly to Phnom Penh. I had booked a seat on what is supposed to be a “luxury bus” from Saigon to Can Tho, and the modest price of around US$8 included a taxi ride from my hotel to the bus terminal. The taxi ride was about two miles, so that alone would have cost $8 in many places, but this was just the beginning. I was dropped off at some kind of travel office where no one spoke any English that I was aware of, but the people seemed to know who I was and where I was going, so I wasn’t worried. A few minutes later they signaled that my bus was here, so I went out to find what looked like one of those parking shuttle buses at airport, with big seats, lots of legroom, and plenty of space for luggage. Finally! I had found the luxury bus I was after. The slightly frustrating thing about Vietnam, and this is more my problem than theirs, is that there just isn’t really much of a demand for Western tourist buses for individual riders, so even their high-end bus companies are made only to fit the locals. It makes perfect sense that they’d only need to make sure that people who are never over 5’8” have enough legroom, but it can be a problem for those of us who are nearly 6’4” and also wider than average. So this shuttle bus thing pulled out and picked up about 10 or 12 other passengers, and then started heading out to the main road. There were maybe 18 seats on this thing, so not only did I have lots of legroom, but I also had an empty seat next to me. After about 45 minutes of driving in heavy street traffic the bus turned into a huge bus terminal, and I was crushed (figuratively). It turned out this was only a shuttle to get us to their main terminal, and the other people on the thing were probably going to other destinations as well. Someone pointed me to my actual Can Tho bus, and I climbed aboard. It was just like all the others before, meaning that my knees were permanently mashed into the seatback in front of me. And once again, every last seat was taken before we left, so I’d be in that position for 3 more hours (minus the halfway rest stop). I’d gladly pay $16 for a seat on a bus with more legroom, but they don’t exist in Vietnam. Yes, I could conceivably buy two seats, but not only is that embarrassing, but it would also probably be nearly impossible to pull it off since my seatmate and I don’t speak a word of each other’s language. Besides, sitting sideways is barely more comfortable than sitting straight forward with my knees locked in. 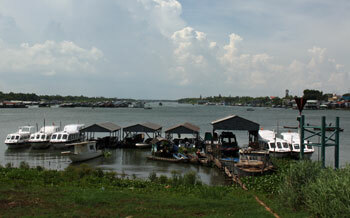 If I did have any romantic visions of the “Mekong Delta” then arriving in Can Tho would have trampled them. Basically, it’s a huge city (maybe 1 million people), which just happens to have a wide river running through part of it. I’d really enjoyed all the Vietnamese cities I’ve been to so it’s not a problem. I’m just saying that there was nothing special or unique about it that I could see. I was dropped off at the company’s bus terminal on the close side of the delta, about two miles away from the small tourist zone. I was the only English-speaker on the bus, and fortunately a couple of people there outside the terminal spoke enough English to find me a taxi and get me on my way. One of them phoned for a taxi and then asked for money for the call, which I paid. Soon I was dropped off at the Tay Ho Hotel, which (according to various reviews) was the cheapest hotel in the small tourist district that actually overlooked the river. I’d also read that the place had opened about 5 years earlier and was quite nice, but ALL the recent reviews said it was filthy. I usually think online hotel reviews say more about the reviewer than the hotel, so I was fairly sure the place would be fine, and what can you expect for $10 per night with a great view? For example, I’m constantly seeing hotel reviews that insist that the “hotel staff was VERY rude!” and yet in the many hundreds of hotels I’ve stayed in I can’t think of a single time I was treated rudely. My guess is that people book the cheapest room they can find on the internet, and then ask to be upgraded to one with a view or a larger room, and then when the desk clerk says no they decide to get their revenge with a nasty review. But this time, it turned out the Tay Ho Hotel was filthy indeed. I’d honestly never seen a place like it. When I first checked in they put me in a room without Wi-Fi, and then moved me to a room with good Wi-Fi, and then finally to a room (as I’d requested) with a river view in the front (for $2 more). So I was in three rooms within about an hour, and all three of them had dust on the walls and several other things that demonstrated that the housekeepers only cleaned about 70% of the things they were supposed to, and completely ignored the rest forever. There were no rats or weird smells or other things that would make staying there impossible – it was mostly just things like there were front windows with shutters on them and it was clear that they never actually cleaned the outside of the window. And they were careless. When I woke up the first morning I rolled over to find that my earplugs had fallen out next to the pillow. Then I remembered I hadn’t used my (identical) earplugs, so these were from the previous guest, and probably trapped under the far pillow the whole time. Anyway, I stayed all three nights and I was glad I did, rather than moving to another hotel without that view. It was so insanely hot and humid all the time that I didn’t actually do much more than just walk around the tourist area a few times. I do have a couple of observations though. The primary “attraction” in Can Tho is the opportunity to take a small boat over to a nearby “floating market.” One problem for me was that these small boats are all piloted (for some weird reason) by old women, and they aggressively try to recruit passengers for these private rides. One even accosted me as I was checking into the hotel and then kept bugging me for two days. The weird hassle with this is that they beg you to let them take you on their boat, and then when you ask how much it costs they quote a price that’s about five times what I know is the going rate. So either you WAY overpay, or you end up in a bitter haggling session with an old lady so you can get her down to $2 per hour for her and her boat. Either way, you feel like a jerk. I would have done it anyway, and I’ve done that sort of thing many times before, but the bigger reason I didn’t go see the floating market is that I’ve officially had it with “markets” that are meant for tourists. I’ve been to a few floating markets before, including one earlier on this trip in Halong Bay, and they are indeed fascinating. The problem is, just like all other markets, they tend to be a lot alike. 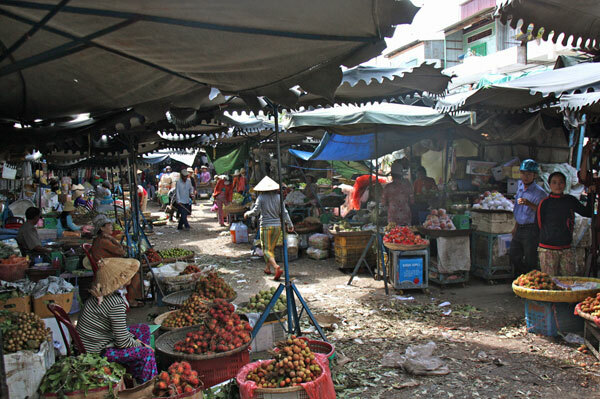 Also, this, like many other tourist regions, is filled with markets. There are outdoor city markets, indoor city markets, fresh meat and veggies markets, night markets, weekend markets, flea market-style markets, and so on. Each is very interesting at first, but as mentioned above, they almost all look exactly alike after seeing a few of them. One minor exception was the Vietnam War surplus market that I visited in Saigon, but even that one was mostly fake and gimmicky items alongside mountains of normal stuff. Continuing with this rant, these markets in these tourist areas are nearly all set up for locals to trade with each other, but whenever they see a foreigner coming to snap photos they all make sales pitches for whatever souvenir items they have alongside the local stuff. So walking through most markets means constantly hearing “Hello!, Hello!, Hello!” shouted from every other vendor. While it certainly is a friendly greeting to hear in a sea of Vietnamese people speaking Vietnamese to each other, to engage them is to hear their souvenir sales pitch. Since I am backpacking indefinitely rather than heading home on a plane soon, I have no use for souvenirs. This means I end up wearing my iPod earbuds as I walk through these markets to drown out the Hellos, and after a few trips up and down the aisles I realize that I’ve seen all this stuff several times before, and it might have been a mistake to go out of my way to come to this market in the first place. Believe it or not, floating markets work the same way. 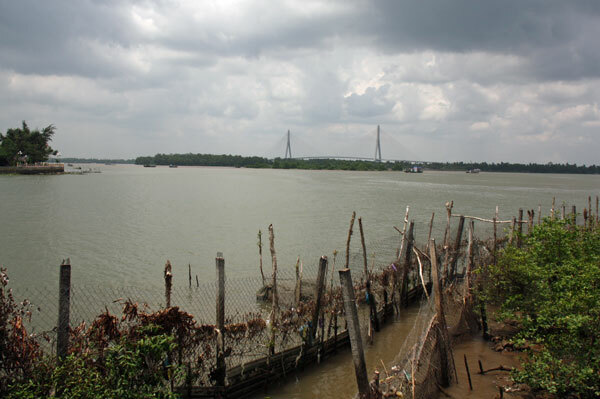 They exist in river areas that are prone to flooding on the banks, so traders can haul their stuff to a central location regardless of flooding conditions. Nearly all the stuff is meant for locals, but ones that have tourist visitors also have some souvenir items, and when you are in a boat being piloted by someone who gets a commission from everything you buy, you mostly just get one souvenir sales pitch after another until the tour ends. So my new policy is that I’ll avoid market-based sights unless it’s something I haven’t seen before, or I happen to be in a position where I can buy souvenirs. I actually love buying little trinkets in Asia, it’s just that I have no room for them now. I just want to say now that I’ve found dozens of markets around the world to be fascinating and worthwhile, even in spite of the constant sales pitches. When I get to Istanbul I’m looking forward to touring through the Grand Bazaar. It’s just this brings up one of the complications of long-term travel and spending a long time in one region in general. Things tend to look similar from one place to the next, and they blend together, taking some of the thrill out of seeing the new stuff. It’s still a thrill to go to a brand new place and start all over again. The other major thing that hit me, finally, when I was in Can Tho was how the climate impacts the general lifestyle all over this region. In Vietnam more than any other country here, the women all wear those surgical mask-type things whenever they are in the sun. Some say they wear them to combat the smog from all the motorbikes, but the real main reason is they want their face in particular, but also their whole body, to have the lightest skin possible. I’ve heard from many people that “people in this country or that country prefer to have light skin” but I’ve also discovered that is true of nearly all of Asia. Evidently this used to be true in the Western world as well, where those with dark skin were obviously laborers, if not farmers, and those without a tan were the upper class or at least working indoors. Obviously now that’s switched in the West, as a tan means you have lots of leisure time, but here in Asia they actively discriminate against those with dark skin. Sound familiar? The above part I had come to learn early on in Vietnam, and I was already aware of it for the most part. But what I saw in Can Tho was different. I’d known that the Vietnamese generally do the siesta thing, where they literally take a one-hour-or-so nap right in the middle of the workday, usually a bit after noon. That really bugs me in Spain, but at least in Vietnam they don’t close the shops, they just take a nap and stay open. I’ve gone into restaurants around 1pm to find all three employees fast asleep on benches. And I’d also heard that they tend to be quite active in the morning instead. A British guy I befriended in Nha Trang told me he’d seen the beaches packed with locals at around 5am, and to be honest I didn’t really believe him. 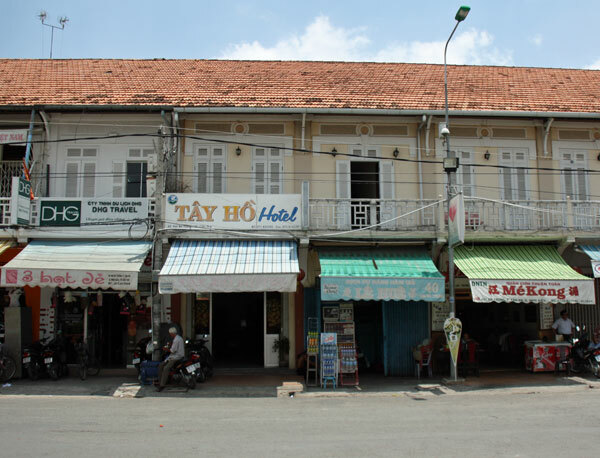 So probably the best thing about the Tay Ho Hotel was that the room overlooked what is more or less the town square public park of this part of the city, and there’s a long veranda out front with benches, so it was comfortable sitting out there and observing. 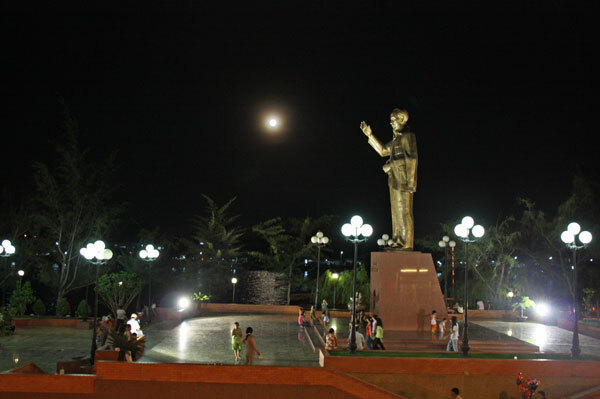 The centerpiece is a large Ho Chi Minh (Uncle Ho) statue, so you could tell this was not just a neighborhood park. I noticed that at noon this park was completely empty to the point of seeming eerie. And then after the sun went down the place began filling up, to the point that by around 9pm it looked like the county fair. 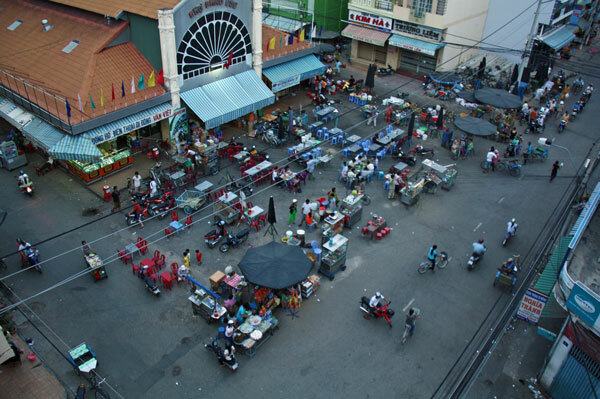 There were food stalls and people selling other items, plus thousands of locals. The following morning I was woken up by an unusual sound. It was 5:30am and I looked out to the park to see that the noise was a rather loud hacky-sack game, being played by about 6 guys dressed all in white. The rest of this park was jammed with people as well, almost as it was the night before. Many people were exercising, or at the very least doing that odd-looking Chinese thing where you slowly make simple poses for some reason. The same thing happened the next two days as well. They aren’t staying in the park all night, they are going home to sleep for 5 or 6 hours, and then coming right back to get some exercise., and it’s all due to the always-hot-and-steamy climate. Only the rich in Vietnam have air-conditioning, so nearly everyone uses fans and open windows to cope with the heat and humidity. They can’t really exercise when the sun is out because that can give you heat stroke if you aren’t careful. So they come out for a couple hours literally before the sun comes up, take a nap a bit after noon, and then come out for a few more hours after the sun is down. It’s a very strange life-rhythm to me, but it seems to be pretty much universal in this area. So when tourists like me complain about the ridiculous heat and humidity every day and every night, it’s because we haven’t even begun to adapt to it like they have. They honestly don’t even walk while the sun is out, preferring motorbikes or bicycles for even the shortest of trips. On the other hand, it’s pretty much impossible to switch to their life rhythm as a tourist. The main attractions are only open from 10am to 6pm or so, and some do shut for a couple hours in midday. So it’s not like we can go to museums at 5am or 9pm, unfortunately. My final three days in Vietnam would be spent at the border town of Chau Doc. I got a bus from the same company, and this one was smaller like a van, but at least I was assigned a seat just behind the wheel well with no seat in front of me, so I could actually stretch out. Again, they dropped me off at their terminal at the outskirts of town, but this time there was no one at all who spoke any English. There were about a dozen guys crowding around me, and all of them were bike-rickshaw drivers who were begging me to hire them for my ride into town. The problem was that these bike rickshaws have a unique design that makes the thing more or less just a shallow bucket. I could have gotten in, and my luggage also would have fit, but I would have been very uncomfortable, so I walked out to the main street to look for a taxi. One of the drivers followed me and then eventually called me a taxi, which showed up a couple minutes later. Soon I would be in the center of Chau Doc checking into the Trung Nguyen Hotel. This hotel reminded me a lot of the one I stayed in in Hanoi, except this was only $9 per night instead of $22 per night. It was like a boutique hotel with a very comfortable bed, though the room was barely big enough to fit it. 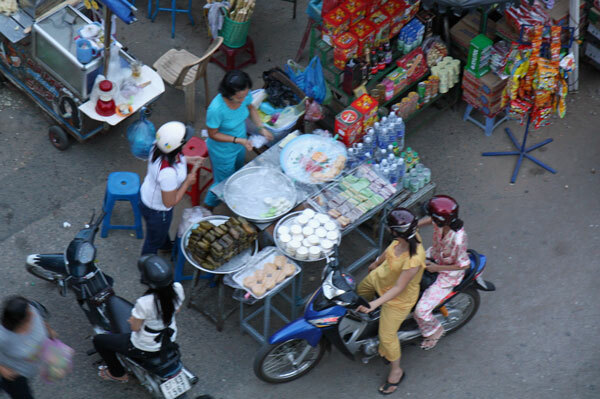 The best part is that each room has a large balcony overlooking the central market of Chau Doc, so I was able to closely observe daily life from 5 floors up. Honestly, there is almost no tourist infrastructure in Chau Doc for English speakers, except for a couple of large 3 and 4-star hotels on the river. For the budget traveler there are only a few restaurants that have English-translated menus, and none of them I tried were any good. 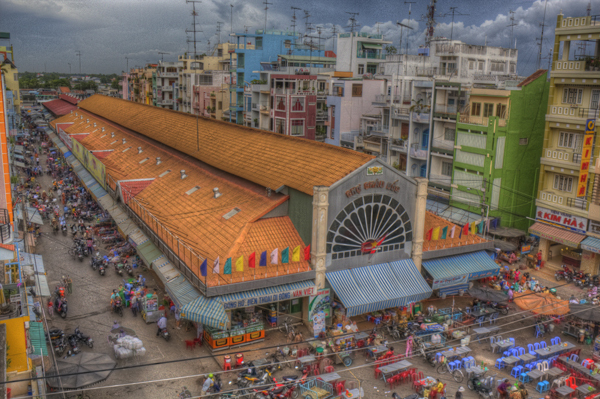 So I did almost nothing except walk around the city a few times, and check out the big central market a bit. This market was just like the others, but since there were almost zero Western tourists they aren’t used to badgering us, so they pretty much left me alone. 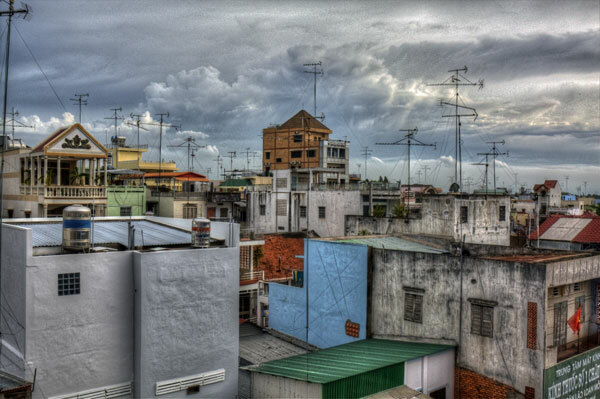 I took two HDR photos from that balcony that I really like. The one above is obviously of the central market, and the one just below is of the city itself just turning the camera about 90 degrees. I really like all the textures, colors, and detail of this photo, even though the subject itself is pretty ordinary. Three days later I climbed into an 11-seat “fast” speedboat to Phnom Penh, and my four months in Vietnam would end about 30 minutes later when we got to the border crossing on the river, which I will discuss in the Phnom Penh section.